Beijing Review: How do you define green and low-carbon development? What does it mean to China? Zhou Dadi: Green and low-carbon development is totally different from what China has pursued in the past. The focus is on both promoting economic development and improving the quality of people's life. Before, China valued industrialization, therefore the economy was based on the wholesale construction of industrial facilities, manufacturing of consumer goods, improvement of housing conditions, motorization of transportation, etc. However, such a massive use of materials has resulted in excessive per-capita energy consumption, serious pollution and climate change. The negative effects of traditional industrialization in less populated countries are not as glaring as those in China. Therefore, China should not blindly copy, but instead explore a new and unique development pattern. Now, China's economy is at a bottleneck, and it can no longer be supported by low-end capacity expansion, mass production of traditional consumer goods, and low environmental standards and labor costs. China's per-capita GDP is roughly $7,000 annually. To achieve the developed countries' GDP per-capita level of $20,000-$30,000, China has to expand its production capacity by three or four times its current level if it sticks to the old development pattern. The market, however, is saturated. Green and low-carbon development can not only alleviate environmental pollution, reduce energy consumption and boost productivity, but it can also raise the added value of labor. Currently, although many Chinese people can afford to own a car, the traffic gridlock in large cities is debilitating. Though housing conditions have been significantly improved, air pollution can't be stomached. Such phenomena indicate that the old development pattern should be phased out. 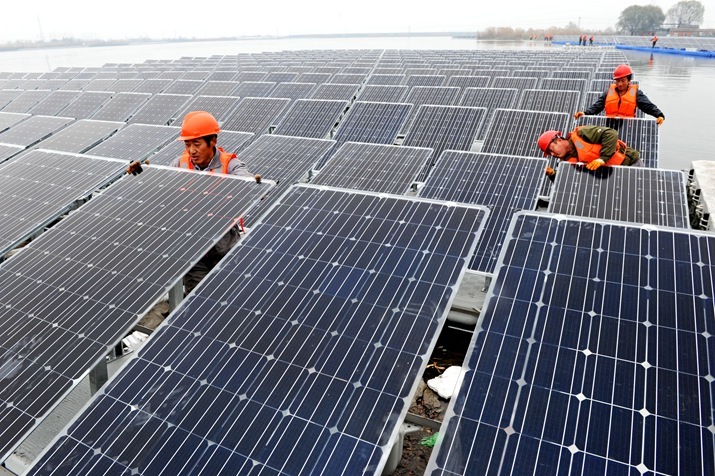 What challenges does China face in pursuing green and low-carbon development? Firstly, green and low-carbon development relies on a high level of technology and innovation. However, China now mainly serves as a manufacturing base for the developed world, which specializes in producing high-end equipment and has mastered core technologies. For example, the output of cement, precious metal, iron and steel in China is very high, but many production equipment and technologies are imported from developed countries. That is to say, there is huge potential for economic growth if we invest more in innovation, research and development. Secondly, people with vested interests, and even consumers, are reluctant to abandon profitable methods and technologies that they are used to using. The replacement of old production capacity also takes a long time to accomplish. If policy makers don't take the initiative to promote new and more rational models of production, the process could even be lengthened. Since China abounds in coal and its policy makers believed at one time that more coal exploration and utilization would contribute to energy security, the coal industry has had excessive investments poured into it. Now, overcapacity has led to low price competitions, which hinders the expansion of renewable energy and natural gas usage. For example, households often prefer burning coal instead of natural gas when heating up their houses during winter, and many factories refuse to pay more for the use of renewable and clean energy. Therefore, policy makers need to provide guidance and impose restrictions. Thirdly, social awareness needs to be enhanced. The government should let people know why they have to behave the way they are told to and which sector needs more investment and input. Of course, if the government doesn't clarify the reasons, it will be difficult to convince people. Besides that, some local governments and enterprises don't take green and low-carbon development as a positive measure, and instead see it as an obstruction to economic growth. The government should work to change that mindset. How is green and low-carbon development progressing in China? In fact, the country is already working on it. The Central Government has emphasized ecological awareness, drafting green development into its 13th Five-Year Plan (2016-20), and shown a proactive attitude by making bilateral announcements on tackling climate change with countries like the United States and France. Some companies have also started exploring new consumption models and pursuing energy conservation methods. However, when mentioning economic growth, what occurs first to most people is the construction of industrial parks and factories, real estate investments and the sale of land. From this perspective, most people are not too familiar with the new developmental pattern and therefore tend to slide back into old habits. They have not managed to integrate tapping into new social demands by building resource-efficient and environmentally friendly societies. In the future, more work needs to be done to achieve this. In President Xi's speech at the opening ceremony of the Paris climate change conference, an emphasis was made on the creation of a low-carbon energy system. What is your view? Low-carbon energy systems feature high efficiency from the conversion of energy into services. It requires people to minimize the consumption of high-carbon fossil fuels, do their best to save energy, and make non-fossil fuels their main sources of energy. For this process, low-carbon fossil fuels such as natural gas should be promoted. In the future, when renewable energy power generation is popularized throughout the nation, natural gas can still be used effectively. As a matter of fact, some developed countries have already realized the transition. Under the 13th Five-Year Plan period, China will have to control its total energy consumption and undergo structural adjustments. Only then will we see energy use heading toward green and low-carbon sources, representing national governance innovation and the demands of green development. When will China complete the construction of the low-carbon energy system? Each and every country in the world is required to reach zero carbon emissions by the year 2100. As the world's largest developing country and second largest economy, China has to take a lead in the low-carbon initiative to achieve that goal ahead of time. How do you evaluate the 2015 climate change conference? Will China manage to peak carbon dioxide emissions before 2030 and increase the share of non-fossil fuels in the primary energy mix to around 20 percent? Over 180 countries have so far submitted their Intended Nationally Determined Contributions, which indicates that they have all realized the effort that is needed to combat climate change and are willing to make contributions according to their capabilities and obligations. China has shown a positive attitude and is likely to scale up its efforts in the future. According to my calculations, the chances are good for China to peak its carbon dioxide emissions ahead of 2030. In addition, if the consumption of fossil fuels doesn't increase rapidly and new energy consumption mainly comes from non-fossil fuels, China is likely to achieve that 20-percent goal. Now, China is striving to curb the use of fossil fuels. In my view, it's likely to exceed the 20-percent goal. But I hope that policy makers can still harness the coal-to-liquid and coal-to-gas industries, the production of coal power and the like.